Update 15.09.2006 - patch 2 - To increase the recieved and dialed calls limit do seem 0050_0001 and 0051_0001 offsets 8F and 93 both to value 32 (50 numbers). Thanks to Cool_Boy-PP! 1. New Windows optimized LangPack (English and Russian only). 4. New iTunes - Vassio with IVLite and Address Book tools. 5. New keytone system sounds performed by Saleiro and compilled by SharkExE. NO POPPING SOUND! 6. Voice shortcuts and DualBoot integrated. SPECIAL thanks to SHARKEXE - that monster pack was not going to be the same without his help! Big thanks to Saleiro too! You can flash with MULTI FLASH FLEX or RSD LITE and you can flash over 42R / 43R / 44R / 45R / 46R / 48R / 6FR / 70R based engine ONLY! 29.June.2006: Starter XP reached the new final i3.46 version. New skin, new gaintable, new iTunes, new syssounds, voice shortcuts, WVIM working and DRM updates. 06.May.2006: Update pack 2 is available - websessions and outbox>resend are fixed, new funlight.pat and gaintable, new operator list and dual bootloader fix are inside. 02.May.2006: Starter XP have new major release - i2.46R! The new features are listed above! 14.March.2006: Starter XP is going to integrate iTunes in the next releases. The grand change is that now itunes is working with 1000 songs limit (preety enough) and that skins are available. Also MotoTunes make it much easier to update the datbase. The new StarterXP i1.48 TE is available! 06.March.2006: Starter XP 1.48 Third Edition is available for download. 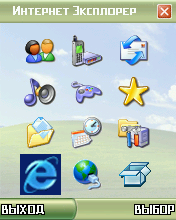 The WindowsXP skin is remade and you will not have any problems installing other skins on the phone (even light skins). The DRM is updated again (new BT, Active line and SMS icons) and some patches are added - disabled check for signed corelets and all seems are unlocked. 1. DSP 623BAB000 (in 1.48 it was older) - big thanks to BodyGuard for the navigation on how to patch it. 9. Minor seem edit adjustments to fit your needs. 26.February.2006: version 1.48 is rolling! All things included from 1.46SE + Vibe then Ring is fixed + now we are on 48R engine. The only thing missing now is the java over bluetooth patch which is not yet released... Every day new version is a good tempo! 25.February.2006: version 1.46 SE released! Now Moto skin is removed from the menu (thanks to budilaks!) - you have more phone memory! Sim applications are finally back. WindowsXP skin am/pm clock bug fixed. - ability to use picture from transflash in phonebook (browse trough pictures and apply as phonebook picture). 06.January.2006: version 1.45 FINAL released. Many bug fixes - all for good. I will not show any changelog - just go ahead and flash it - you will see! Flash and Forget! 03.January.2006: version 1.45-test released. Heavy optimizations on the file structure on a and c. Moto skin fixed (thanks to budilaks). Windows skin date and clock position and colors are fixed. JBenchmark shows 40 on first run and 41 on second run - if somebody is every interested from this software. 01.January.2006: Happy New Year & Starter XP 1.42 is now released. Outbox -> resend issue fixed and one MP3 song in Sounds (can be deleted). That's it! 31.December.2005: I am back to the 45R project. The menu is now heavy reorganized. Almoust everything possible that can be enabled is added in the menus. Very stable and very long battery life (you will feel it!). We are back to 3GP video. Hopefully after fixing the annoying resend bug in the Outbox that will be my final release! What can I say - if you like Windows based skin then just flash, forget and have a happy new year! 12.December.2005: version 1.3 released. No MobileQQ, no AIm, no Chat, no IM, EMS removed, MMS templates and crap pictures removed. 8306 total memory! Now it is 6FR based with UNLIMITED VIDEO RECORDING (which can do up to 50min video by phone hardware limits). 06.December.2005: version 1.2 released. Fixed Airplane mode in Settings. Now Ring styles is in Multimedia and Voice Records outside (I got multiple requests). Mobile QQ, IM and Chat are removed from "Office Tools", because nobody uses them. MMS templates removed completely (useless). Quick Notes removed from Messages (useless - use drafts). 5. Biggest thanks to SharkExE for cooperating in every part of the package!